When I was a child, my biological father was asked to reside in an old Catholic convent his school had acquired. The convent no longer housed nuns, and would one day be renovated to be a Guest House for hospitality students. But, with eighteen bedrooms and a pool (for baptisms), it was an expensive house to leave empty and to maintain. Thus, we had the privilege of living in it for the first two or three years of my life, rent-free. Though nuns no longer resided in the convent, the Catholic Church still owned the kindergarten it had watched over. That was the school I had attended. The school, in turn, overlooked the Catholic Church below. As a pre-teen, I then chose to attend Mount Alvernia High School, an all-girls Catholic School, created by the Franciscan Order in 1925. I was there for five years. This school and my university are the only schools I have ever attended for more than two consecutive years. While I am not a religious person by any means, this kind of background does leave its mark. I find I am naturally drawn to books through which the thread of religion weaves its way. I will sit with Christians and discuss theology, when they are reasonable, anyway. Religion, while it has zero attraction for me as a believer, nonetheless fascinates me as an outsider. And, of all the religions and denominations in the world, not a one fascinates me as much as the Roman Catholic Church. It isn’t surprising then, that when writing The Moreau Witches, I could not resist weaving that thread of Catholicism into the tale. However, I did not take a traditional or pious route. Instead, I juxtaposed religion against revenge as the witches turned to a Higher Power to not only protect themselves, but avenge those dearest to them. The book starts off on this very note as Olga, a respected medicine woman in Haiti, is lynched when she fails to heal the son of a White planter. Angered by grief and the injustice of Signeur Boucher’s actions, Maria, the daughter of Olga and a neighbouring planter, turns to Vodou to avenge her mother. Maria now threw the Sekrè open and found the exact passage her mother had shown her, so many years before. She had memorised it in her sixteenth year when she had been ordained a mambo si pwen, but, like her mother, and hers before her, she had never found cause to use it. Tonight, she would make no mistakes. She would not say the words with half-hearted interest, as though they were foreign to her. Tonight, she believed. And tonight, she would call on all the powers of Darkness to do her bidding. The book then jumps to a century later in France, where young Madeleine, the main protagonist of the novel, witnesses the abuse of her mother at the hands of her father, a jealous and hot-tempered man. Though Madeleine prides herself on being a scholar of science, she is clairvoyant and later learns of her father’s intended murder of her mother through a dream. When Basile indeed plants a dagger in his wife’s chest, but then denies any knowledge of where his wife’s body rests, Madeleine’s first thought is vengeance. In time, it completely consumes her and the black abyss that has scarred the family’s legacy begins to rise to the surface once more. “Pray tell, what vice is that?” Gaëlle enquired. Gaëlle could neither find the words nor the courage to respond to Mamie. Gone was the benevolent old woman of charity and love. In her stead was the cunning and determination of something feral. The Moreaus are not the only people in the book who at times uses—or warps—religion for their own ends. Indeed, in many ways, their use of religion to serve vengeance is tame compared to the lengths some of the other characters are willing to go to attempt treachery. And thus, rather than create a story where the forces of good and evil battle each other with easy distinction, I set my leading ladies on a grey line of morality and left it to the readers to be judge and jury. Madeleine is impulsive and—ironically enough—she is known for the same temper that drives her villainous father. Rather than use her eloquence to be diplomatic and placate her father, she more often uses it to strike a verbal blow. She perhaps inherits that eloquence from her mother, Charlotte, who is, however, not quite as feisty as her daughter. She is known for her empathy and generosity, but her main vice is her pride. It is this pride that compels her to remain in London, though she knows her husband plans to kill her. Why? Because to go into hiding would mean giving up her career. Despite these flaws, Mamie walks an even thinner grey line of morality than her child and grandchild. This is because she is the only woman of the three who is not above dirtying her own hands to reap the personal satisfaction of justice and revenge—even if it means murder. If you somehow managed to miss the news —I’ve been shouting it from the rooftops!—The Moreau Witches eBook is now available for pre-order at 99 cents all through October, excepting October 31st when it will shoot up to $1.99. Thereafter, the price will be $2.99, which is the standard price I decided on. The print version of the book has a tentative release date of Thanksgiving, November 22nd. Learn More About the Pre-Order and Upcoming Raffle! No, You’re Totally Ready to Just Get the Book, Now. 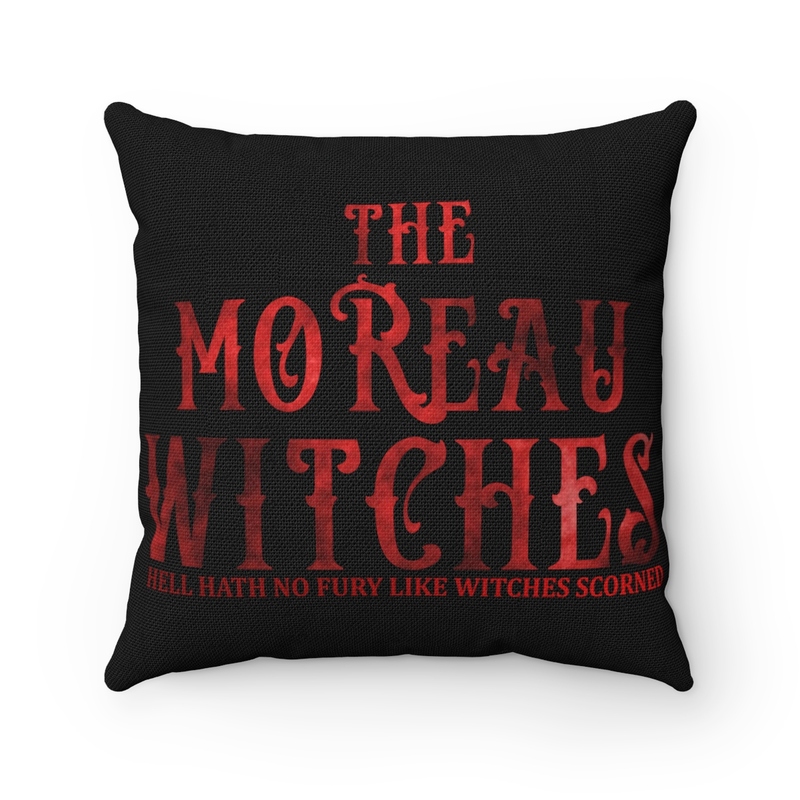 —And Maybe This Awesome Pillow Case for the Sofa to Set the Mood? I pre-ordered! Can’t wait to get the link to read the entire thing! I will probably also buy the print edition for blogging purposes. I saw, thank you! You’ve been entered in the raffle as well. 😄 I’ll get it to everyone who pre-ordered as soon as possible with worst case scenario date set for October 29th. Fingers crossed! Sounds wonderful – and scareeeeey. I’ll order!